This recipe is at the request of Hung Huynh (No, not the Top Chef Hung Huynh. ), who was searching for a recipe for Canh O/Kho Qua Nhoi Thit (Vietnamese Stuffed Bitter Melon Soup) because his mom always made it for the lunar new year. I'm in the can't-eat-it camp as it's just way too bitter for me. After all the eating I've been doing from the lunar festivities, I figured a few light Vietnamese soups were just the thing. But as I'm not in the habit of making foods I can't eat, even for the blog, I made this with bi dao (Vietnamese fuzzy gourd winter melon) and bau (Vietnamese opo squash). If you wish, I finally made Canh O/Kho Qua Nhoi Thit (Vietnamese Stuffed Bitter Melon Soup). While the inside of bitter melon isn't edible, the inside of winter melons are so you can save those and toss them into the soup pot as well. Serve about two portions per person so this should feed at least four people. Soak a small handful of tree ear mushrooms in water to soften. Mix 1/2 lb ground pork with 1 minced shallot, 3 minced garlic cloves, 1/2 tsp salt, 1/2 tsp ground black pepper, 1 tsp sugar, and 1 tblsp fish sauce. Set aside. 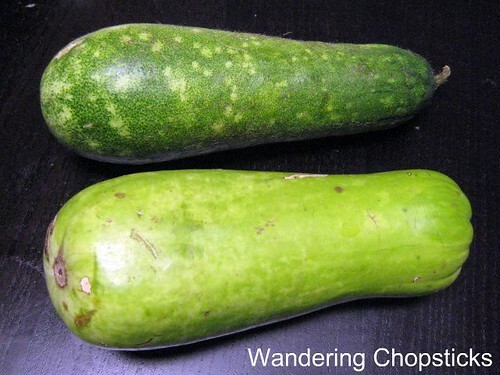 Peel winter melon, cut off ends. Hollow out centers with a spoon or knife. I used a serrated grapefruit spoon for ease. By now the meat should be nicely marinaded. Add in the tree ear mushrooms and mix thoroughly. Stuff the centers of the winter melons. If there's any extra meat, you can form small meatballs which will just flavor the soup broth. Place the stuffed melons into a stock pot with enough water to cover by several inches. Turn the heat on high and when the water boils, turn heat down to medium or medium-low and let simmer. Skim any scum from the top. 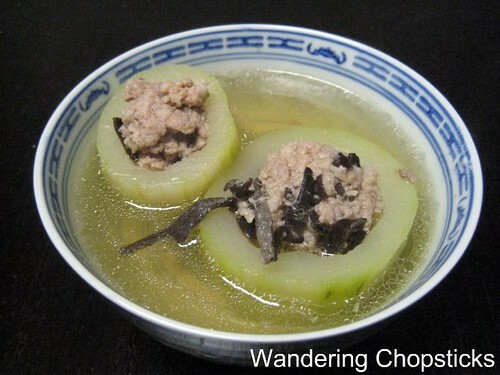 After about 15 to 20 minutes, the winter melon will be cooked when it becomes translucent. Taste the broth and add fish sauce if necessary. Serve as a soup or spooned over rice. 1 year ago today, Angel Hair Pasta with Bacon, Balsamic Chicken, and Diced Tomatoes. oh yum! I love this soup. It's very comforting to have after a hard day of work. What a great solution, WC! I can sometimes eat the bitter melon if it isn't too bitter, but can never count on that! Ooh, I have never heard of this dish, but it sounds lovely! Thanks so much for the recipe. I will definitely try it out. Been chomping on burgers for dinner a lot lately. 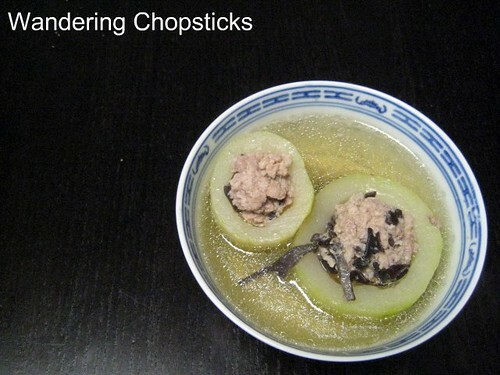 When I was younger, my mom used to get so mad when she would make this but I'd only eat the meat and leave the bitter melon still floating in my bowl, hehe. Though I don't enjoy the actual veggies by themselves, I really like the flavors that bitter or winter melon contributes to the soup. Even the broth becomes too bitter for me. BITTER MELON SOUP rocks! One of my favorites, although I've learned not even to offer a taste to non-Vietnamese friends. The bitter makes you strong! I'm starting to try bittermelon a little more, but honestly, I just don't enjoy eating bitter foods. I made this with opo squash or what we used to call summer squash. I added some cubed ham and chicken broth in with the water at the end. I also added glass noodle and water chestnuts in with the pork mixture. Wow. It was the best soup I have eaten in a while. My kids loved it too. What a great meal on a cold fall day!